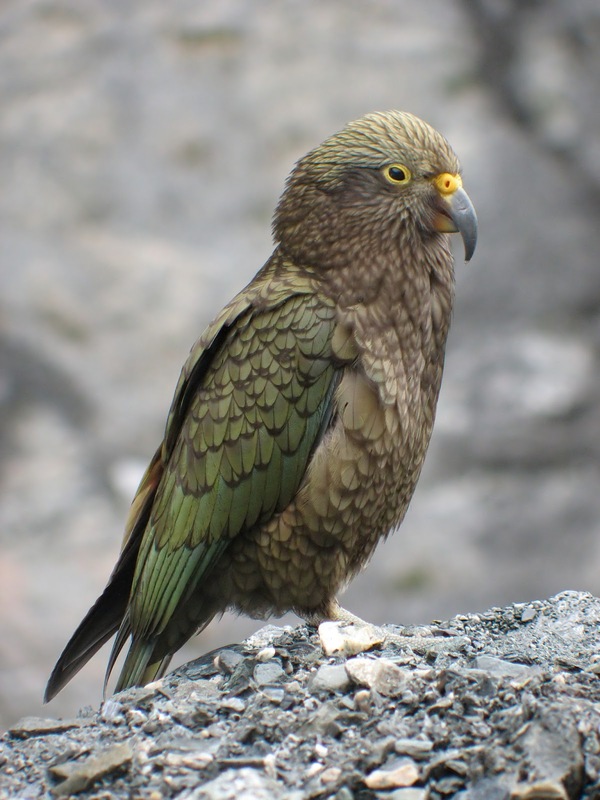 The Kea parrot is among the very few members of the species that live in lofty mountains, particularly in New Zealand. But this does not mean they are not suitable as companion birds. This kind of parrot can actually adjust to any environment. While they have been known to live in windy and cold conditions, wild Keas often fly off to low lying forests and grasslands. They can even be seen wandering the coastlines. It is during the summer months that Keas go back to forested highlands that can go as high as 1,900 meters in elevation. They can be found mostly in burrows, riverbanks, and even in places that have plenty of large tree roots. A Kea parrot can eat almost anything that you can throw at its mouth. They have known omnivores. A typical diet for this parrot includes plant leaves, flowers, roots, fruits and seeds. They definitely love berries, but they can also gobble up worms and insects. Keas also eat garbage and dead and rotting flesh. They used to be hunted for bounty because they attacked livestock, specifically sheep. In zoos and as pets, Keas can be fed with the usual parrot mixes, nuts, fruits, and vegetables. You can also put in eggs, live worms, and even dog biscuits as special treats. If the climate in your area is extremely different from the natural environment of Keas, do not forget to give your pet some vitamins and other supplements to keep it healthy. In the wild, a Kea parrot is estimated to have a lifespan of 15 years. But in zoos, many Keas have lived for more than 20 years. This can only mean that Keas can be your companion parrot for a long time. Taking a closer look at the physical features of this bird, you will see that Keas are primed for survival. For one, their feathers are thick and can provide ample protection against harsh environmental conditions. Next, they have long and bony beaks that allow it to reach into or pry open difficult food sources. They even have sharp claws that allow them to root out underground food such as worms. On top of its survival instincts, the Kea parrot also oozes with inquisitiveness and intelligence. Experts have been fascinated by this parrot's strong interest in newly found items. Keas have also been observed to apply a fixed social structure, where each member of the group (called a pandemonium) cooperates in finding food. Truly, all these characteristics make Keas some of the best companion parrots to care for. Gideon Williams is a Kea parrot expert. Another Rare Bird Is the "KEA"
The Kea bird sometime referred to as "the clown of the mountains" because of its ability to amuse people. I say amuse but some of the local people often refer to it as an irritation specially if they are chewing on the aerial of your car or stealing items from your backpack and flying away with them. 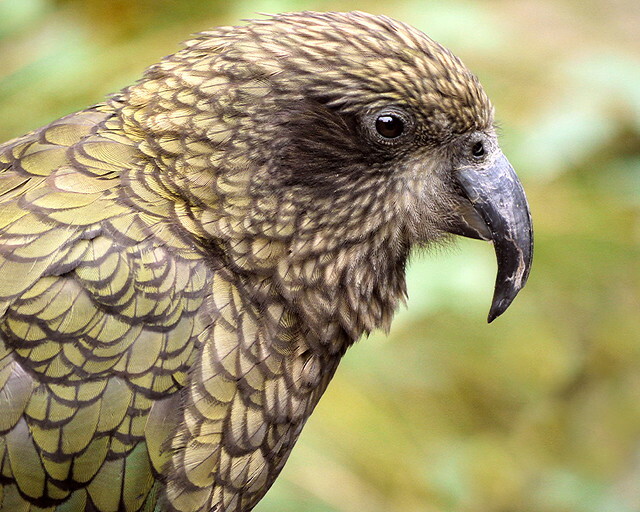 Regardless the Kea is one of the few remaining birds' indigenous to New Zealand. The Kea is in fact a parrot, a very large parrot. They are approximately 20 inches long and weigh in at about 2 lbs. They are mostly olive green in color with beautiful orange feathers on the underside of their wings. These orange feathers can be seen when the Kea is in flight. The feathers on the lower back are orange/red while some of the outer wing feathers are blue. The Kea have strong grey beaks with the longer upper beak being slightly curved. They use this beak to feed on the several kinds of plants available in the mountainous region of the South Island. They also eat other birds, sheep and rabbits. They have also developed a taste for people food. They seem to enjoy pasta, apples, grapes, bread, nuts and even some dairy products. The Kea bird breeds in the underbrush of the trees known as southern beeches. These clusters of shrubs and trees grow high on the mountain sides more than 1500 m above sea level. The nests are usually on the ground in between tree roots and rock crevices. The Kea gets to the nest by going through a tunnel to the larger nesting area. They cover their nests with moss, ferns and rotting wood. The female Kea which is a bit smaller than the male will lay anywhere from 2 to 5 eggs. The eggs take about 21 days to hatch and the chick stay under mothers care for about three months. The young adolescent Kea resembles the adults but can be distinguished by the yellow ring around their eyes as well as the yellow across the top of the beak. They also have some yellow on their legs. As visitors to New Zealand you will quickly decide if the Kea are an amusement or an irritation especially if they climb on your car and bite off loose pieces of rubber etc. or let out one of their outrageously loud squawks as they peer through your hotel window. Despite their antics the Kea is thought to be one of the most intelligent birds in the world. I hope you have enjoyed reading about the Kea. I look forward to sharing more unique and interesting facts about New Zealand their birds and other wildlife. The Kea parrot is also known as the "nestor parrots" and some call them the "mountain parrots". Keas' lives in the South Island of New Zealand, in the high-altitudes, meadows and mountain range, they nest in burrows under rocks and among tree roots. The Kea has a life span 14 to 20 years of age, stands 16-19 inches tall and weighs between 31 to 35 ounces. The males and the females have basically the same coloring; which is a dull olive green, their feathers are edged with a dark brown giving them a scallop look. Their breast is greenish-bronze, the underside of their tail is green and blue with orange and yellow tips, their crown is a yellowish-green and their bill is a solid brown. One reason they might be called mountain parrots is that their feathers are so thick they can tolerate the cold, snow and windy conditions in the mountains. Their long slim bill is use to find food between the rocks, they also dig for food using their talons which are long and sharp. The Kea's diet in the wild consist of seeds, fruits and berries, roots, leaves, flowers and being omnivorous they eat insects, worms and they also other dead decaying animals. They are very intelligent and very nosy (like they say inquiring minds want to know), if one bird sees something of interest they all will be interested also. They seem to have no fear of humans at all. They will peck the rubber tires on vehicles and sometime even cause damage; they will carry away anything they can get in their beak, from food to toys and even clothing. Kea parrots are very social birds and live in groups of 10 to 14 birds They will even help each other to find food and once found will share it with others. This also is a learning experience for the younger Kea parrots. If a person is thinking about owning one of these parrots they better be able to interact with them because they demand a lot of attention and can be very destructive. Their cage should be at least a sixteen foot square. Individuals do poorly in captivity so if you are really brave I would suggest at least having two, to keep each other company when you are not there, if that isn't an option try hanging some mirrors so he doesn't feel so alone. Toys are a necessity to provide the activities that these curious and intelligent birds must have to stay physically and emotionally healthy. Give toys that require them to solve a problem; like taking something apart to find food such as dried fruit or nuts or something else to chew on or just taking what he found apart, anything that will stimulate and keep them busy. Remember also the Kea parrot loves to dig and play in dirt put a box of dirt in the corner of his cage and hide pine cones, nuts, pieces of wood, rattles and if you can stand it why not some worms. Alice Gines is a Kea Parrot enthusiast.